Vibrantly coloured guest information folders/ conference folders made from a wood effect material. 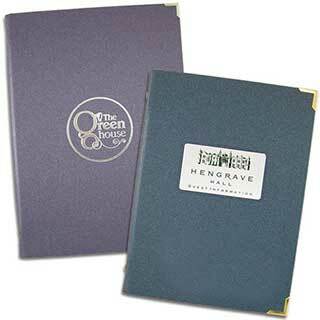 These folders are durable, scratch and water resistant and come in a range of colours. Ring fixing O and D Rings in A4 and A5 sizes. Also available in A4 and A5 size with tag fixing. Personalised metal plate in a wide range of sizes. Personalised blocking or embossing. Optional gold or silver corners. All prices include standard titles such as 'Guest Information'. Colours available: Grey Cork, Natural Cork, Burgundy, Charcoal, Cherry Oak, Dk Blue, Dk Green, Dk Oak, Grey, Lt Blue, Mink, Mushroom, Orange, Rosewood, Royal Blue, Yellow. A4 size laminate folder made from matt laminated paper with a wipe clean surface, ideal for foil blocking. Colours: Graphite, Silver, Burgundy, Bronze, Dk Blue, Lt Blue, Red, Black, Mocha, Cream, Dk Brown, Mulberry. Information is held in clear pockets showing 4 to 20 sides available with a tag fixing. Pockets can be added to the inside front and rear covers at extra cost. Gold or silver corners can be added. Can be Foil Blocked in Gold or Silver. All prices include standard titles such as Guest Information. Your logo or text can be foil blocked - One off set up cost £35. Minimum quantity 10. Although made in the traditional style this faux leather folder is supplied in a wide range of colours, both traditional and vibrant. Can be foil blocked or heat embossed. Also available with custom full colour metal plate. Also available in A5 size, and Ring fixing 'O' or 'D' Rings in A4 and A5 sizes. Each tag fixing folder has the possibility of up to 20 sides to show. This is a very versatile hotel folder. Optional gold or silver corners. Optional built-in pockets. Colours available: Blue, Black, Bluebell, Bronze, Burgundy, Dark Brown, Champagne, Dark Green, Jade, Lime, Orange, Silver, Tan and White. All prices include standard titles such as Guest Information. Your logo or text can be foil blocked in Gold or Silver. Metal plate available in gold, silver or white printed in full colour. One off set up cost £35 for up to 90 sq cm subject to sight of artwork. Minimum quantity 10. K/N. One of our most popular products, the woodgran laminate folder has been improved and is now available as a room folder and with its wide range of finishes is suitable for many different types of establishment. Ten wood finishes available. Each custom folder can be personalised. Personalisation by engraving or using a metal plate. Engraving: - Your design with a colour infill. Metal Plate: Gold, Silver or White - Set up cost £35 for up to 90 sq cm subject to sight of artwork. Our versatile tag fixing can be used to hold up to 20 pages of printed information held within plastic pockets. Alternatively our ring fixing can hold paper or optional plastic pockets with two or four 20mm rings in two styles. Also available in A5 size. Vibrantly coloured guest information folders/conference folders made from a heavy textured linen-like material. 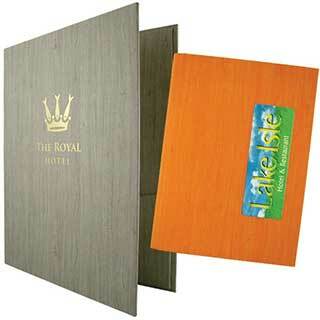 These hotel folders are durable, scratch and water resistant and are available in a range of colours. Information is held in PVC pockets using a tag fixing. Ring fixings in O or D ring can be supplied. Personalised metal plate in a wide range of sizes. Pockets on inside front and back covers can be added at extra cost. Available in A5 size. Personalised with foil blocking or heat embossing. Optional gold or silver corners. All prices include standard titles such as Guest Information. Textured colour range. Colour available: Black, Bronze, Putty, Metallic Red and Gunmetal. Your logo or text can be blocked - Foil Blocked in Gold or Silver. Heat embossed. Printed Metal Plate available in gold, silver or white - One off set up cost £30 for up to 90 sq cm subject to sight of artwork. Minimum quantity 10. Mon. 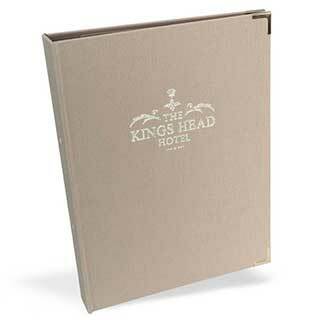 This stylish padded faux leather folder with swirl design is ideal for hotel guest information or document folder. It has an elegant faux leather cover which is supplied in six different colours combining a smooth and textured finish. 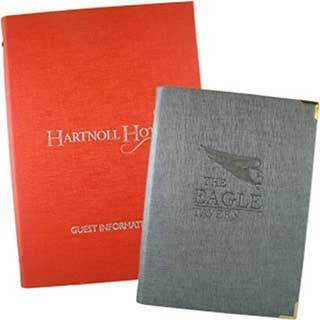 These hotel room folders can be heat embossed with your own design and free titles are available. No charge per item for heat embossing. All prices include standard title 'Guest Information'. Pleated corners. Pockets on inside front and back covers can be added at extra cost. A soft feel padded and stitched cover in a range of six colours - Black, Blue, Dark Brown, Green, Grey and Tan. A textured faux leather hotel folder made from soft faux leather with a textured feel and a range of beautiful colour finishes. The folder can hold up to 20 sides to show. Also available in A5 size and Ring fixing O and D Rings in A4 and A5 sizes. Each folder can be personalised and gold or silver corners added. Inside back and front porckets can be added at extra cost. This is a very versatile hotel folder. 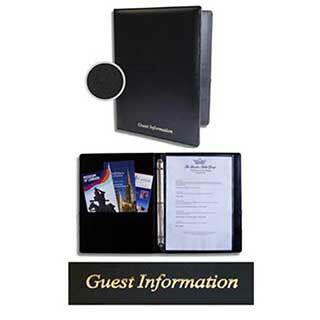 No charge for Foil Blocking or heat embossing for standard titles eg 'Guest Information'. 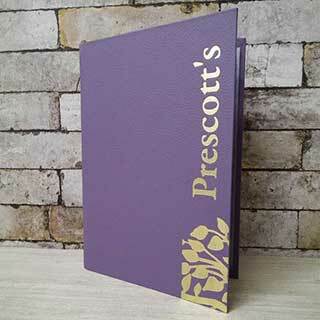 There are a number of personalisation methods available to personalise these room folders including heat embossing and a full colour metal plate. Colours available: Black, Green, Red, Sand, Blue, Light Brown, Burgundy and Dark Brown. The crocodile skin feel menu folder has been a favourite in many restaurants and hotels and is now available in room folders. Available in A4 and A5 tag fixing. Also available in O and D ring fixing in A4 and A5 sizes. This crocodile skin feel room folder features an interesting texture in several striking colours and is given a brilliant finishing touch by a personalised metal plate or foil blocking. Pockets on inside front and back covers can be added at extra cost. Bright crocodile skin textured cover available in Sand, Red, Plum, Pearl, Orange, Nightshade, Mystic and Blue. Free Standard Titles blocked in gold or silver 'Guest Information' in various fonts. Printed Metal Plate - Plate in gold, silver or white. Personalised Blocking in gold or silver One off setup charge £30 up to 90 sq cm subject to sight of artwork. Minimum Quantity 10. Ig. Available in A4 and A5 sizes tag fixing and A4 and A5 ring fixings. 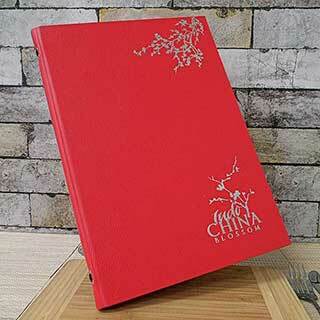 Personalise by heat embossing, gold or silver blocked and full colour metal plates. These folders are perfect for all establishments. Internal pockets can be added at extra cost. Colours available: Grey Cork, Natural Cork, Burgundy, Charcoal, Cherry Oak, Dk Blue, Dk Green, Dk Oak, Grey, Lt Blue, Mink, Mushroom, Orange, Rosewood, Royal Blue, Yellow. All prices include standard titles such as 'Guest Information'. Your logo or text can be blocked - Foil blocked in Gold or Silver, Heat embossed One off set up cost £30 up to 90 sq cm subject to artwork. Printed Metal Plate available in gold, silver or white - One off set up cost £30. Minimum quantity 10. Or. These wooden boxes have been designed to be an alternative to traditional room folders. They can be personalised by engraving or using a metal plate with your own logo. With its wide range of finishes, these wooden boxes are suitable for many different types of establishment. Ten wooden finishes - shades may vary - Black Ash, Light Ash, Whitewashed, Ligh Oak, Dak Oak, Maple, Walnut, mahogany, Cherry and Distressed Oak. Six bonded leather spine colours. Several personalisation options. Engraving: - Your design with a colour infill - Set up cost £30 for up to 90 sq cm subject to sight of artwork. Metal Plate: - Available in gold, silver or white - Set up cost £30 up to 90 sq cm.. Minimum quantity 10. Wooden Boxes. This standard A4 size faux leather hotel guest room folder is ideal for hotel guest information or document folder, it has a faux leather cover which is supplied in black or burgundy. This hotel guest room folder has 'Guest Information' embossed in gold on the front cover. On the inside of the front cover is a stitched pocket for stationery or information sheets. Manufactured from good quality wipe clean faux leather. Down the inside centre is a silver coloured metal 3 ring binder so that plastic pockets can be added, which can hold hotel information, menus or leaflets. This standard A4 size faux leather hotel guest room folder is ideal for hotel guest information or document folder, it has a faux leather cover which is supplied in burgundy or black. 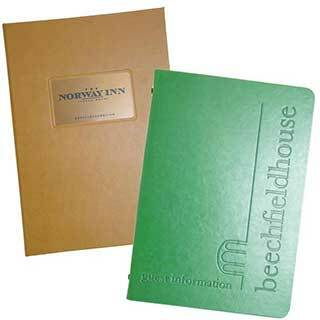 Guest room information folders are manufactured from strong hearwearing buckram material that is textured and available in a wide range of vibrant colours. Available in A4 and A5 sizes tag fixing and A4 and A5 O and D ring fixings. Each room folder can be personalised with foil blocking in gold or silver, heat embossing, or with a metal plate printed in full colour. Optional gold or silver corners. Internal pockets inside front and back covers at extra cost. Minimum quantity 10. These many options for creating a unique room folder are complimented by the availability of a number of personalisation methods. The choice of internal fixings are tag fixing, D Ring fixing or O Ring fixing. This crocodile skin feel guest information folder features an interesting texture in several striking colours and is given a brilliant finishing touch by a personalised metal plate or foil blocking. Each folder is available in two sizes with two different internal fixings. Our versatile ring fixing can be used to hold paper printed information or plastic pockets. Guest Information' in many styles Foil blocked in gold or silver. Available in A4 or A5 sizes with two or four 20mm rings in two styles o and D. We also now offer additional internal storage with built in pockets to match your cover colour at extra cost. Stunning new wood effect folders in our tough wood effect fabric with two tone wave design which combines a soft padded feel cover with an authentic wood style grain. Available in a range of four colour combinations to blend with your room décor. 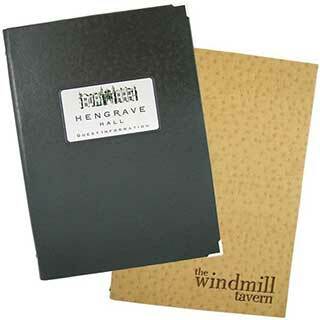 Personalise the front cover with heat embossing and add interior options to suit your establishment. Plastic pockets are held in using our versatile tagged cord fixing. Built in pockets inside the front and back cover can be added for extra storage. Colour available: Charcoal/Grey, Cherry/Rosewood, Light Blue/Dark Blue and Mushroom/Dark Oak. 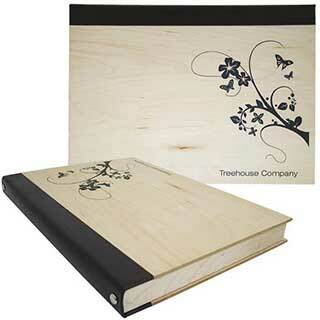 Customise your covers with your own text, logo or design using heat embossing. One off setup cost £30 for up to 90 sq cm subject to sight of artwork. 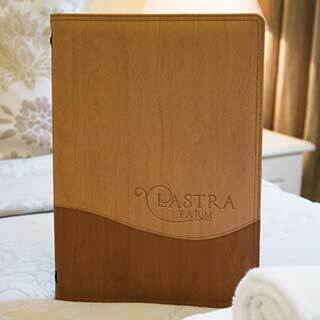 This great addition to our popular range of guest room folders can be personalised in any full colour design. We can create a fully customised design for you using your own logos and images, alternatively simply send us your desired artwork. 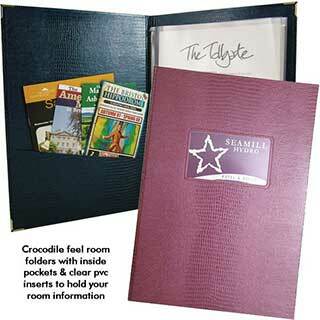 Each room folder is available in two sizes A4 and A5, with two different internal fixings. Our versatile tag fixing can be used to hold up to 20 pages of printed information held within plastic pockets. Alternatively our ring fixing can hold paper or optional plastic pockets with two or four 20mm rings in two styles O and D. We also now offer additional internal storage with built in pockets to match your cover colour at extra cost. Full Colour Personalisation: Covers can be supplied in any full colour design. One off setup cost £45 up to 90 sq cm. Lining colours: Bronze, Burgundy, Dark Blue, Graphite, Light Blue, Pale Green, Purple, Red and Silver. Minimum quantity 10. 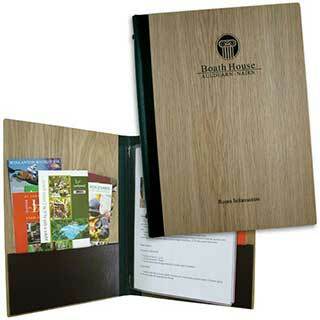 Each room folder is available in two sizes A4 and A5, with two different internal fixings. Our ring fixing can hold paper or optional plastic pockets with two or four 20mm rings in two styles O and D.
Alternatively, our versatile tag fixing can be used to hold up to 20 pages of printed information held within plastic pockets. We also now offer additional internal storage with built in pockets to match your cover colour at extra cost. Full Colour Personalisation: Covers can be supplied in any full colour design. One off setup cost £45 for up to 90 sq cm. Lining colours: Bronze, Burgundy, Dark Blue, Graphite, Light Blue, Pale Green, Purple, Red and Silver. Minimum quantity 10. Our Canterbury guest room folder is manufactured from high quality faux leather but has an elegant look and a feel of smart classy leather. Available in A4 and A5 sizes with tag fixing and A4 and A5 sizes with ring fixing. These hardback faux leather room folders have the look and feel of fashionable leather and can be supplied in a wide range of modern colours. 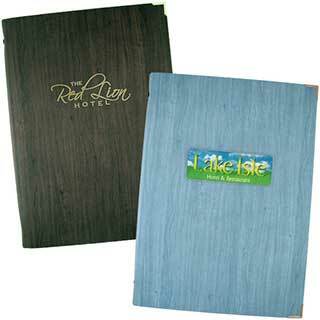 Our Soft touch guest room folder in A4 size is manufactured from a new synthetic fabric which has a rubber-like texture. This folder is part of our modern stylish range of soft feel folders. Supplied in five colours:- Black, Blue, Camel, Grey and Red. 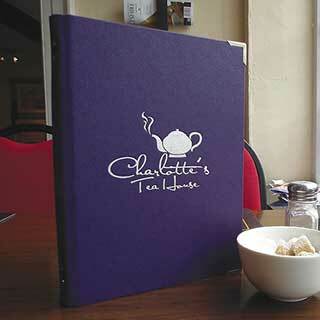 These folders can be customised to suit any establishment. Your logo or text can be foil blocked or heat embossed for a One off set up cost of £30. 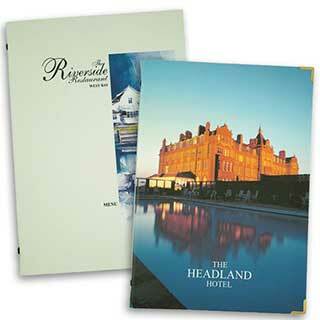 Standard Titles (Free) eg 'Room Information' heat embossed or Foil Blocked in Gold or Silver. A metal plate can be printed in full colour with your own text, logo or design. Plate available in in gold, silver or white for a one off set up cost £35. Folder can be supplied plain with no personalisation. Available in A4 and A5 sizes. Also available as a ring binder folder with 'O' ring of 'D' ring fixing in A4 and A5 sizes. Our Soft touch guest room folder in A5 size is manufactured from a new synthetic fabric which has a rubber-like texture. This folder is part of our modern stylish range of soft feel folders. Supplied in fiv colours:- Black, Blue, Camel, Grey and Red. 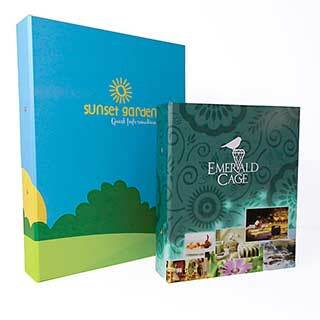 These folders can be customised to suit any establishment. Your logo or text can be foil blocked or heat embossed for a One off set up cost of £30. Standard Titles (Free) eg. 'Room Information' heat embossed or Foil Blocked in Gold or Silver. 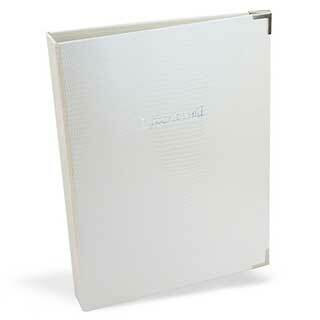 A contemporary woven fabric style guest room folder with a soft texture. Available in 14 colours, Autumn Orange, Beige, Black, Blush Pink, Bright Green, Camel, Dark Blue, Dark Brown, Deep Red, Graphite, Grey, Light Blue, mushroom and Mustard. Also available in A5 size with tag fixing, A4 and A5 size ring fixing O and D rings. Minimum quantity 10 folders. Your logo or text can be foil blocked - choose from various foil colours including Gold & Silver. One off set up cost £35. A metal plate printed in full colour is available in gold, silver or white. One off set up cost £30. Choose from many font styles for the text "Guest Information" from various foil colours including Gold & Silver. This option has no additional charge. Or can be supplied plain with no personalisation.